Robert Gordon (BComm’70) was in Saskatoon this week for his annual MBA visit. As part of the trip, Edwards unveiled the official nameplate for the newly renovated "Robert & Brenda Gordon MBA Classroom." Robert graduated from the College of Commerce in 1970 and then relocated to the United States. After completing his MBA at the University of Chicago’s Booth School of Business, Robert enjoyed a successful career as a management consultant at McKinsey and Company. He also held CEO positions at several business information systems companies. In 2012, 42 years after receiving his B.Comm., Robert returned to Saskatoon to speak at an Edwards School of Business MBA Fireside Chat. The energy and opportunity he saw while back in Saskatchewan inspired Robert and his wife, Brenda Gordon, to provide financial support for students from non-business backgrounds to complete an MBA. To date the Gordons have supported 17 scholars through this award. 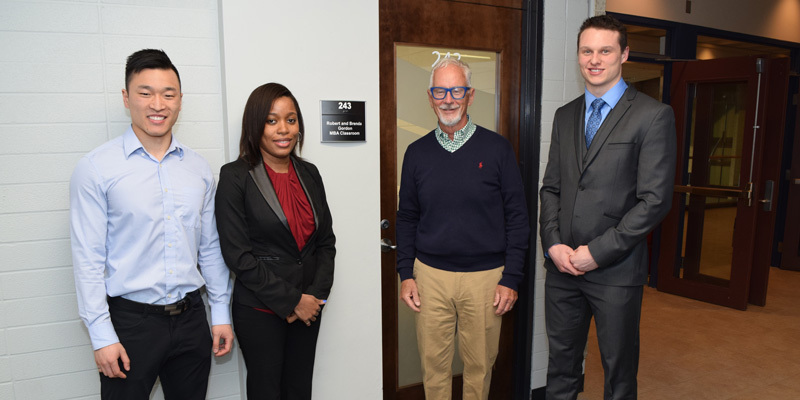 "We are thrilled to recognize the generous support the Gordons have shown Edwards, through the newly named “Robert & Brenda Gordon MBA Classroom," said Interim Dean Keith Willoughby. "We are proud the Gordon’s have chosen to support opportunities for our students." Since his initial visit, Robert has become very engaged with the Gordon Scholars and the MBA class, having returned several times to volunteer his time and expertise. This year Robert hosted a working lunch for past and present Gordon scholars on business strategy. Later in the evening, Robert guest-lectured in the MBA class as a professional development opportunity for students. The cases reviewed by the two groups originated from Robert’s personal business experiences. "We hope to create some spark around people from other disciplines rounding out their technical skills with an understanding of business," explained Robert Gordon. "I think it's an excellent opportunity to add those skills and will make a huge difference in their ability to be successful in their careers."